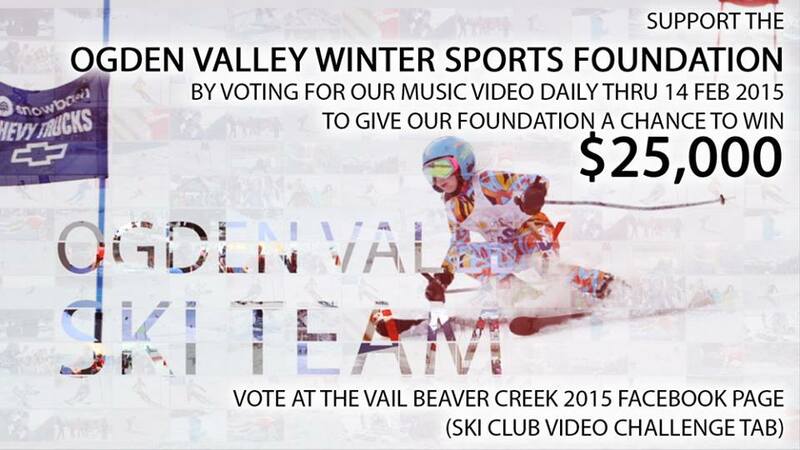 Support our local ski club, Ogden Valley Winter Sports Foundation and Ogden Valley Ski Team by voting on their music video: From OVST: “As many of you know the FIS World Alpine Ski Championships in Vail/BeaverCreek begin this coming week. The likes of Lindsey Vonn and Ted Ligety will be going for gold… Our small foundation here in Ogden has the opportunity to win big as well. All we need to do is get more votes then all the other videos submitted in the Ski Club Video Challenge. So we need you, your kids,your family,your friend and co-workers to all help us out in this quest for “Gold” ... So please see the info here below and remember you can vote daily until Feb 14th 2015…Let’s win this thing and help our athletes get to future World Championships.. it starts here… So please begin by voting today ( and every day) for our video produced by Ogden Valley Ski Team parent and all around local good guy Chris Morgan.” —The key is that everyone can VOTE ONCE PER DAY, so we need everyone to do just that. Set a reminder, but vote each day through 14 February. —Spread the word to others and ask them to vote once per day, too…and spread the word themselves. —How to vote? Either go to… 1…the web page http://vailbeavercreek2015.com/ski-club-video-challenge/ and vote there. ( ours is the video with the OVST ez-up in the picture) 2…the Vail Beaver Creek 2015 Facebook page, LIKE it, then click on the Ski Club Video Challenge where you can then choose to vote. ( ours is the video with the OVST ez-up in the picture) 3. Share it , like it, vote it, instagram it, snapchat it, do anything with it!! Thank you for your support!